Did Steve Jobs forget to mention that Apple has made a smaller capacity new 4G Nano? 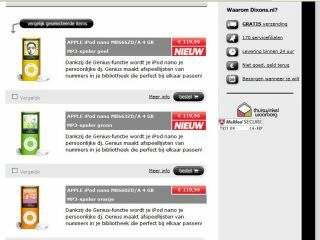 A 4GB version of Apple's 4G Nano has cropped up on Dixons' website in the Netherlands, prompting speculation that Apple has not ditched the smaller capacity for its new range. It is uncertain whether this is an gaffe by the website makers or if there is an actual smaller version of the nano. What the website does state, however, is that a 4GB Apple nano is available in eight different colours for 119 Euros a pop, 20 Euros less than the 8GB version. Engadget has received images from some folks in Europe that actually show off the 4GB models in the shops, which goes some way to confirming a 4GB version – something that was not announced at this month's Let's Rock event. We have contacted Apple about this and are waiting for a response.